The Naschmarkt is one of the greatest outdoor markets. I always spend time walking around from stand to stand looking at all the weird items that I don’t know. It always amazes me how many vegetables and fruits I have never heard of. You can buy any kind of nut, spice or olive. There are also a lot of restaurants and their version of food carts. I always think Portland’s food carts are overpriced when I can come here and get a large portion of homemade pasta and pesto for 4.50 Euros. 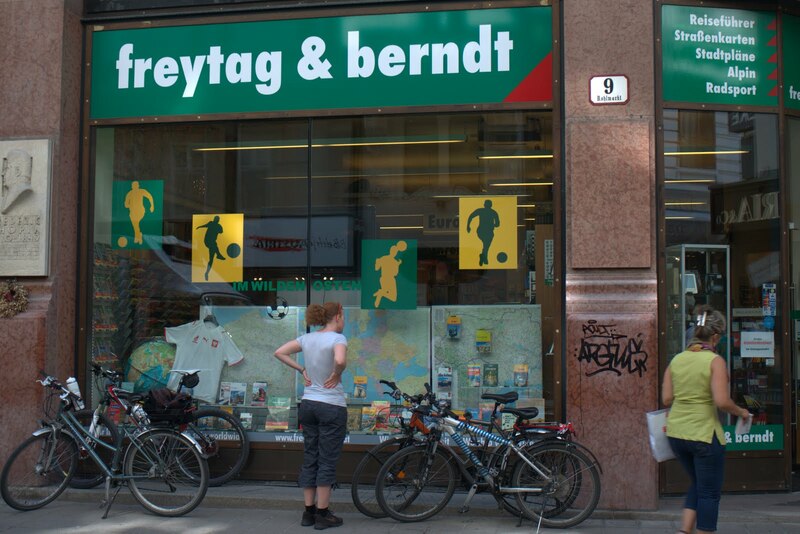 One of my favorite vendors is the Gegenbauer oil and vinegar shop. They have unique vinegars that you can sample. First you smell the vinegar and then they put a little drop on your hand for you to taste. This time I was sold on honey, blueberry and tomato vinegar. I can’t wait to try them on my food at home. 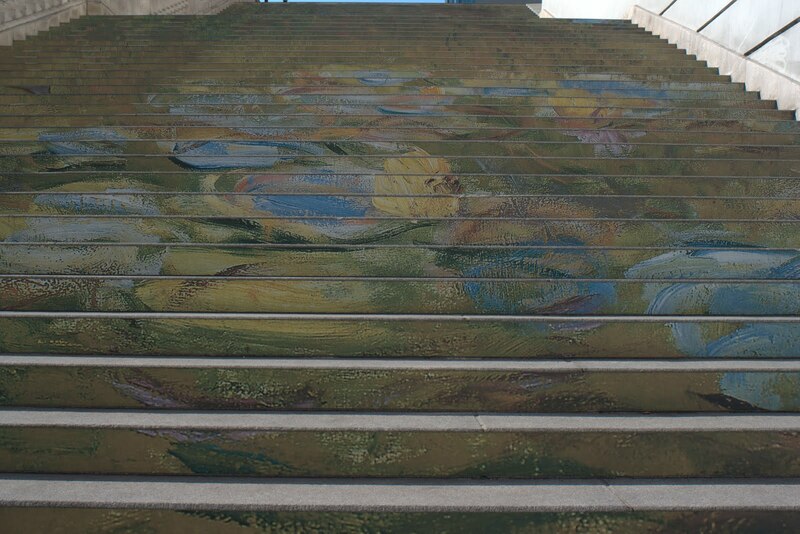 Only in Vienna would they paint their stairs to match the Monet exhibit. Not sure you can tell by the photo and the angle I had but there really is a Monet painting here. It is nice to visit a city and not feel rushed to do everything the instant that you get there. Since I have been here before I know the places I want to go and to eat. I know the most efficient way to get around so it is nice to not have the pressure of figuring out how to get places. It was great to visit Schoenbrunn today and just take a book and read some. To not be in the pack of tourists trying to get a photo of the same fountain is a good feeling. The sun is now rising at 5 so it made getting up this morning a lot harder. I managed to get out and take photos but this was the first time on this trip that I saw many people just heading home from a night out. I thought how I would way rather get a good night sleep and just be starting my day rather than be one of the many people I saw stumbling home. There are many foods from Vienna that I really miss when I’m in Portland. You can’t get the schnitzel or potato salad that you can here. You can’t go to the vinegar stand at the farmers market and have a choice of 50 different varieties of vinegar and sample every single one of them. There is even a Mexican restaurant in Vienna that I always wish I had in Portland. I was pretty bummed to learn that they are closed for the holiday weekend so it looks like I will have Mexican for dinner tomorrow night. I must say though that there is one beverage in Vienna that I always miss and there isn’t really anything Austrian about it. If anything it is very American but I have never been able to recreate it. It is simple. Ice, milk and Ghirardelli chocolate all blended up. I have tried at home but it is never the same. Maybe I need whole milk to make it delicious. It doesn’t matter if I get a small, medium or large it is always gone by the time I get to the subway. Ten years ago I used to get one after class and see if I could make it home and still have something in my cup. I always failed to have something in my cup by the time my train came. Some things just never change. We took a 4 hour train ride from Maribor, Slovenia to Vienna, Austria. It was beautiful mountain scenery which does cause the train to have to go a little slower. I was worried that there wouldn’t be significant room in our train car for my large suitcase but lucky for me I was able to keep it in the bike storage area. The train wasn’t very full so we had 4 seats to ourselves. Arriving in Vienna is now easy since I’m familiar enough with the city to know how to work the subway system. The hardest part is you need to buy your ticket before getting on the subway because all of the public transportation is on the honor system. Naturally the machines just don’t take your money and give you change. You either need to pay the exact amount or you need to pay with your credit card and have a PIN. Since the US is behind on credit card technology, I needed to come up with exact change. I went and asked the nearest tobacco shop for change. We had to take 2 subways, but really that was no big deal. Vienna has one of the easiest subway system to use. We have an apartment near the center of town. We are pretty much across from the Opera house which is one of my favorite places to enter the center of the city. Now I must go out and explore one of my favorite cities in the world. It was time to turn the Polo in. We drove almost 1,000 kilometers in the car. It got us up the Julian Alps and to the Adriatic. It was pretty hard to find a reasonably priced automatic in Slovenia but I’m glad I did. The Hertz in Maribor was not in the center of the city but about 3 kilometers out of the center. We decided to return the car 2 hours early so we could have the rest of the day free. Hertz was supposed to open at 8 so we didn’t think we would have any problem. When we got to the place it looked more like a repair shop and there was a driving school across the way. There was a little sign for Hertz and the door was locked. I asked people in the office next door (seemed like they were the AAA of Slovenia) and they went and got the phone number. She called Hertz for me and said they would be there in 10 to 20 minutes. The guy arrived and filled out the paperwork. He asked what we were doing in Slovenia and I just said visiting and that it was a nice country. He said it is not nice… it is the nicest. It is good to see people proud of their country. It was a 30 minute walk back to the center through the outskirts. Not the nicest walk and only one German Sheppard wanted to jump the fence and attack us. 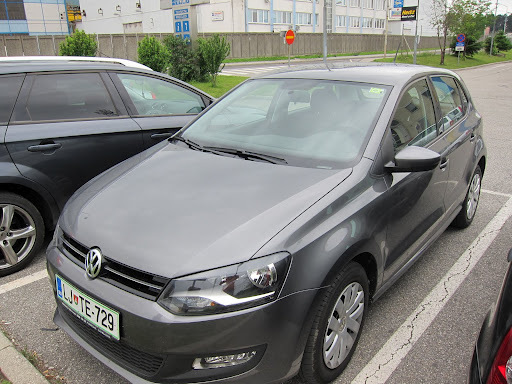 Here is a photo of our little Polo. Maribor has been different from any other city in Slovenia I have visited. There aren’t tourist busses or English menus everywhere. There were some cute clay houses around all of the trees on a main square. I’m pretty impressed that people don’t steal them or knock them over. I can also say I have seen the oldest producing grape vine in the world. Perhaps my favorite photo is of the elevator in our hotel. We have a room on the 6thfloor but you have to push number 3. It is pretty confusing when you are tired. We found a cute market to walk around and then we headed to the square to look at the music going on. We also needed some lunch and since it seems like nobody eats out here it has been harder to find food. Most people eat at home and just go out to get a drink. There were some sausage stands in the square, and we thought maybe we should try some sausage. I walked up to the stand and asked if they spoke English. Naturally they did not so I ordered 2 plates of sausages using German. I would have loved to know that one plate was 6 sausages but of course that isn’t advertised. They were wonderful people and I tried really hard to be polite and eat all of my sausages but I just couldn’t do it. Tomorrow we will be leaving Slovenia for Austria. We went to the train station and got our train ticket. The train station was like taking a step back in time as there were no machines and the station basically had no people. The man did not speak English so I got our tickets using German. Pretty crazy to think that all of western Slovenia speaks perfect English and here is mainly German. I guess we are only 15 minutes or so from the Austrian border. Our drive from Bled to Maribor was about 2 hours. Pretty crazy to think that you can drive across country in 2 hours. We arrived in Maribor and decided that since we still had the car we would go check out a town called Ptuj which was about 20 minutes away. Not sure it was worth the drive but it did allow me to fill up the car before returning it the next day. Ptuj was pretty quiet. Not many shops were open so we just did an hour walk around the city before returning to Maribor. This part of the country is really popular for wine. I suppose if you like wine then you would have a great time visiting all of the wine cellars. The Vintgar gorge was located about a 10 minute drive from our Pension. The gorge was first discovered in 1891 and the mayor thought it would be something that they could build a walk way through and tourists would come. He was right and today it costs 4 Euros which seemed like a bargain for the natural sights along the trail. You can tell they work hard to maintain the wood walk way. There was even a guy sweeping the walkway as we walked. The walk is about a mile each way but I could have stayed there all day. We got there right when it opened so there wasn’t many people there yet. The water was so clear that you could see fish. I took many photos in the gorge and maybe after you see the photos you will decide to buy a ticket to Slovenia. There is nothing better than the sun beating through the window of the balcony door even if it is 5:30. One thing I like about sleeping in the Alps is that I can have my window open all night and I can hear the sounds of crickets when I fall asleep and birds when I wake up (from the moment I stepped out of the car in Bled there was a Cuckoo bird singing). This was the first morning that it was totally nice so I basically jumped out of bed and wanted to walk around the lake before breakfast. The trick was that I also wanted to hike up to a view point en route around the lake. If you just walk the nicely paved trail around the lake it takes around an hour and a half. The owner of the pension we are staying in told us about a view point that is off of the trail. I thought well of course I want to do that. I really didn’t think it could be that bad. Well, keep in mind that decided I wanted my tripod this morning so I added to our load of a backpack and camera. Oh and I didn’t bring any water and it was already warm out. The total hike was 685 meters high (aprox 2,250 ft). My favorite part was the end where there was 80 narrow steps. The handrail on the way up was so high that I had my arm fully stretched out and I could hardly touch the rail. The junior world rowing championships will be here shortly. I can only imagine what this lake will look like completely full. You can tell the locals are getting ready for a busy summer season. My clothes were totally drenched after my 3 hour excursion before breakfast but it was worth it. I can officially say that I earned my delicious breakfast after that walk.